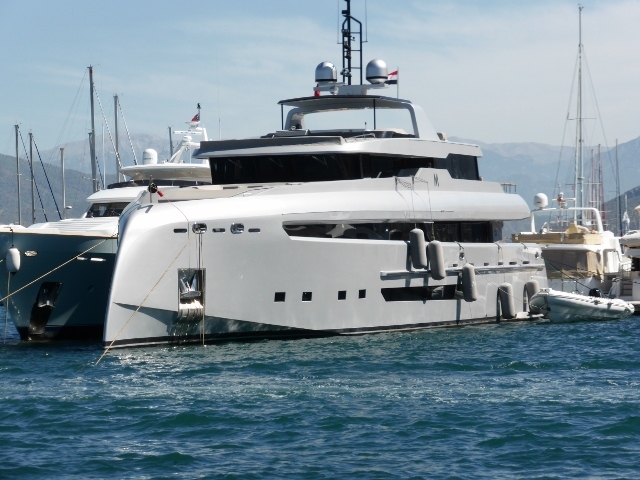 M is a very unusual Super Yacht. It has an inverted bow, which makes it look like one half of a large catamaran. Google it to see the bow, what would an inverted bow add to performance? Why are we sleeping on the bow? Early this morning in Fethiye, James and I are saying, ” Is that Frosty snoring?” No, Frosty doesn’t snore. It was a man sleeping in the cockpit on the boat next door and here are where his fellow crew members were forced to sleep: on the bow, where the noise of the traffic might drown out the constant but sonorous snoring from their friend. I said I understood their reasoning for sleeping on the bow and they burst out laughing, These lovely Russian ladies are part of a flotilla of five and usually sail on dinghies at home. They said Mr Snorer was a lovely guy. 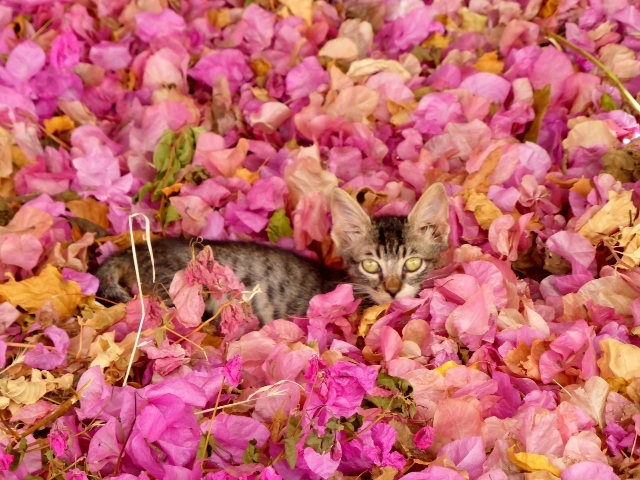 Now that I have shown two boat photos, I am allowed one kitten shot. 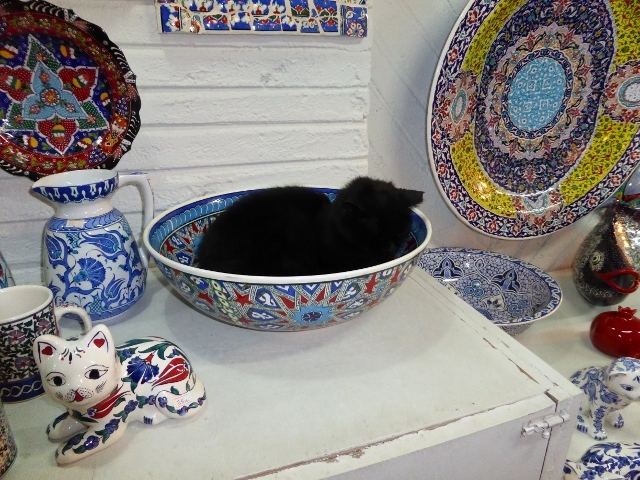 This gorgeous little fellow had found a perfect spot and the shop owner was happy because everyone stopped to look at her lovely wares. Kalkan. The four of us were admiring this very well pruned olive grove, saying someone takes great pride in the pruning. Later in the morning, we saw a large herd of goats come down and they all stood on their hind legs to get their breakfast. Goats can stand on two legs for quite a while. Having fun here, off to an anchorage tonight. We had a surprise visit on Friday morning from a giant thunderstorm, a dust free rain that laundered the bimini and washed away months of dust and salt. It was very cozy having a cup of tea and reading the Sydney Morning Herald while it poured outside, with Mercier secured to pontoon with stout lines. Kas Marina is rather more like a resort than a marina. James and I have been lunching at the pool. 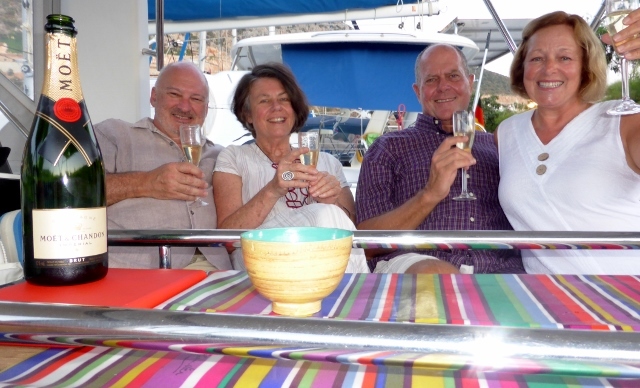 We met some lovely fellow yachties for evening drinks as there is a great social network in the marina. We were introduced by the vivacious Maggie who owns Deja Blue from the CYC. We enjoyed our time feeding the Marina’s fish, roosters and ducks and watching sunsets. During the day we enjoyed taking random Dolmus rides (the shared taxi), and doing a bit of work on the boat. All of this because it is a great place to meet crew coming out from Oz. Frosty and Louise joined us, they came in from Greece via the ferry. We had to fit a lot of Kas into one night. First stop, after Mercier, was Antiphellos. 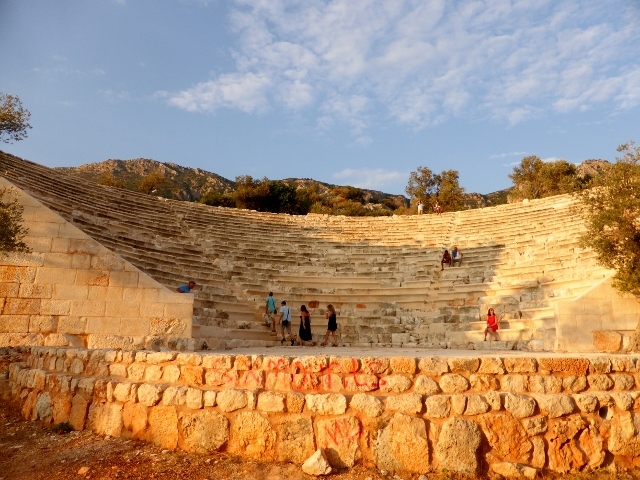 Hellenistic Kas was called Antiphellos and now a small amphitheatre remains, we arrived just before sunset. 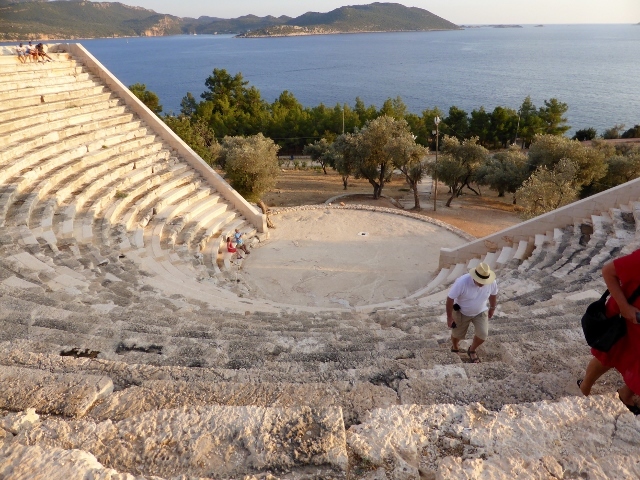 The theatre didn’t have a stage but it did have a view, Frosty and I considered whether we are descendants of Lycian view junkies. It was built in the 4th Century BC but they seem to enjoy a captivating view as much as we do today. We walked through Kas and admired a few shops and we were able to get the last minutes of the sunset at Sako looking back over the harbour to Kastellorizo. We had a leisurely dinner and then went shopping. Frosty was enjoying viewing the carpets and rugs. 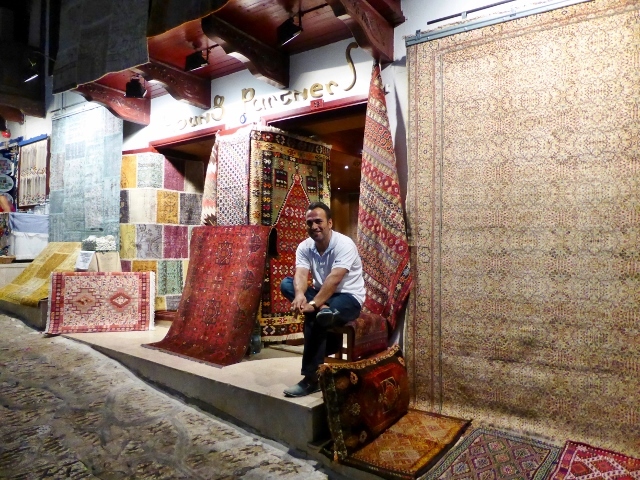 There are several excellent carpet merchants, Recep at Young Partners and Gallery Kas, near Sako. Louise and I managed to admire every bowl, lamp and bronze tray at Tugra Art Gallery. Hmm, they ship and I have taken quite a few photos and there is always next year. There are a few photos we think we would like to squeeze in. First, we went to the markets and the sunflower seed display was very interesting. 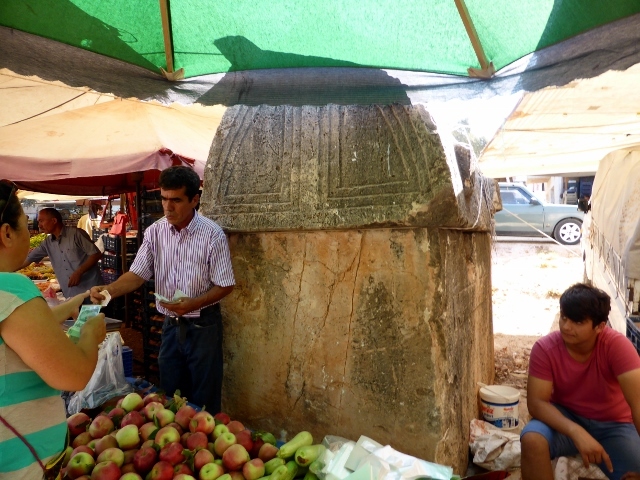 We are intrigued with the fact that local sarcophagi are integrated into every day life, including markets. In Kale Koy, tombs started out with water views but with subsidence, they have become waterfront properties. The turtles swim in front of Hassan’s. The food was yummy but after lunch we needed a swim, so off to Whitehouse Bay. 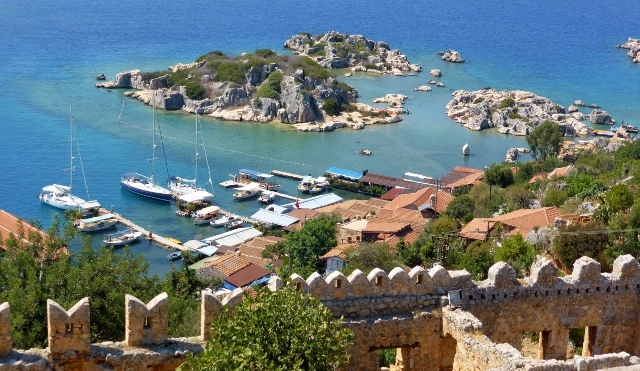 In Kale Koy, tie up to Hasan’s, visit the castle, watch the turtles and have lunch. 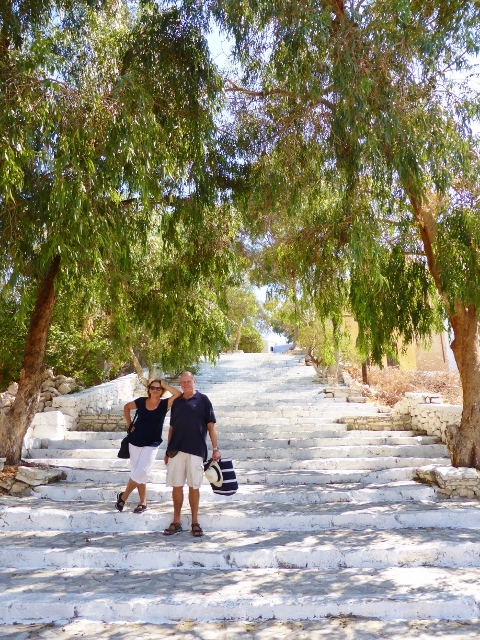 The ubiquitous eucalyptus, on the way up to the castle on Kastellorizo. We said, you know we will be home within the month. It will then be only a short walk to see plenty of gums, lorrikeets and mates. Davo, look at the gum trees. Kas is a lovely place, with the shopkeepers and restaurateurs keeping their invitations low key. History just inserts itself into daily life seamlessly. 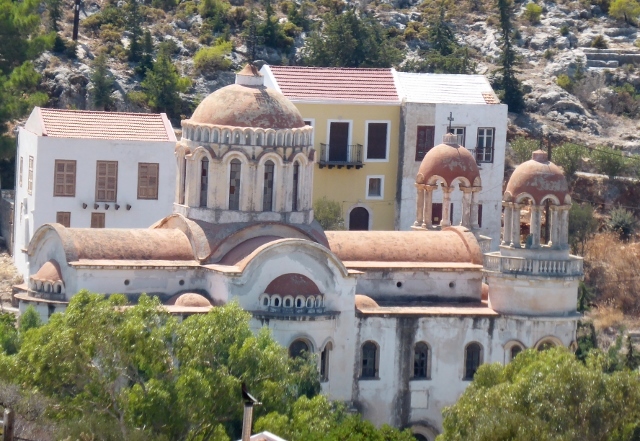 It was Lesley’s last day with us yesterday, she is travelling to Rhodes via Kastellorizo. We have not used up our 90 day Euro allotment for times like these and we decide to take the ferry trip with her. In less time than a ferry trip would take from the Quay to Manly, we are back in Greece and on a picture postcard island of about 5 square miles. The island, also called Meis in Turkish and the older Greek name of Megristi, has a beautiful natural harbour facing Kas. 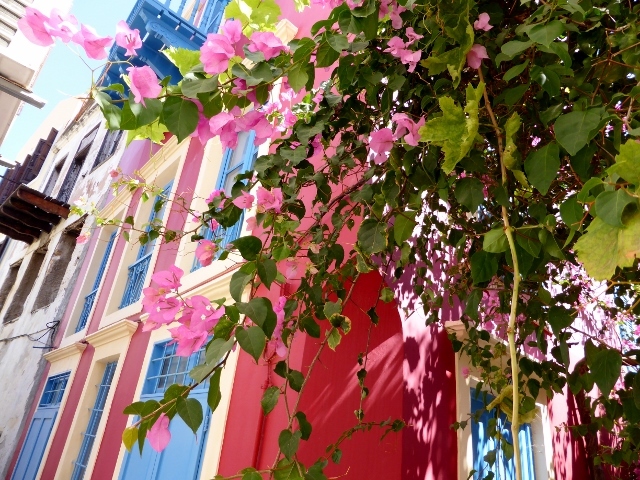 The houses around the harbour and up the hill are either completely renovated, beautiful and colourful or in various states of ruin. 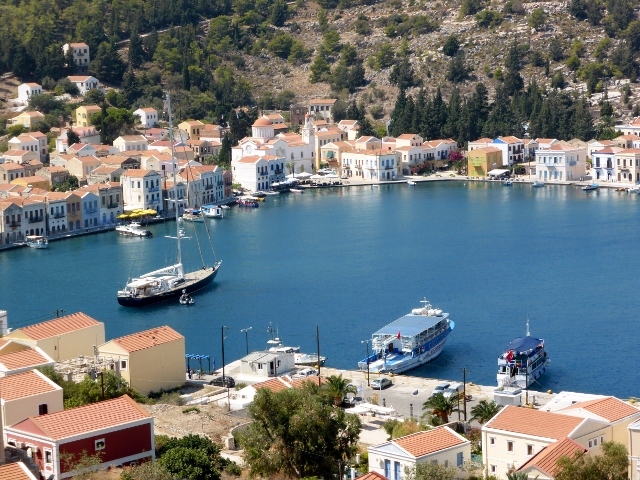 Many residents of Kastellorizo migrated to Australia, mainly Melbourne and Perth with only 500 residents on the island full time. Their descendants are coming back to enjoy the island and to renovate the family homes. One of the joys of travelling is friends’ sharing their experiences so that we are sure to visit, because they have enjoyed the magic too. Dave and Leigh visited and really enjoyed their time on the island. Leigh mentioned the Aussie connection. 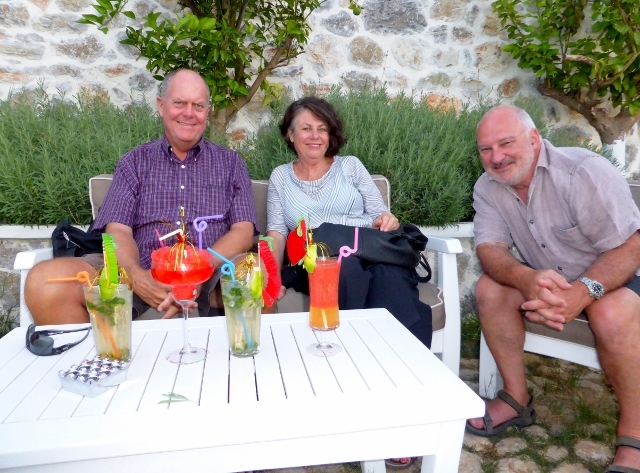 Sharron and Graeme celebrated their 25th anniversary here, danced to a bit of Greek music and broke a few plates. Everything happens on the water front, with the restaurant tables so close the edge of the harbour, you see everything in the water and it is very tempting to throw bread in for the fish. We saw at least three big turtles in the harbour and they would push each other around. We couldn’t tell if it was territorial or amorous in intent. 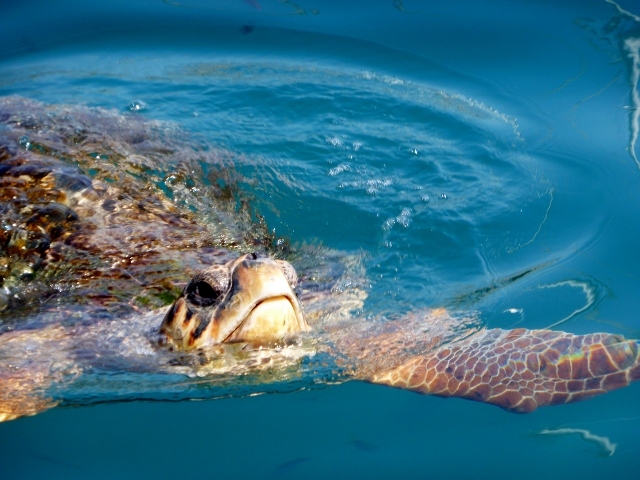 Loggerhead Turtle, asking how our lunch was. When our ferry arrived, within minutes we were walking round the waterfront. The chefs are clever, they fillet their fresh fish and throw the bones and bits to the Loggerheads, which keeps the turtles interested in the foreshore. 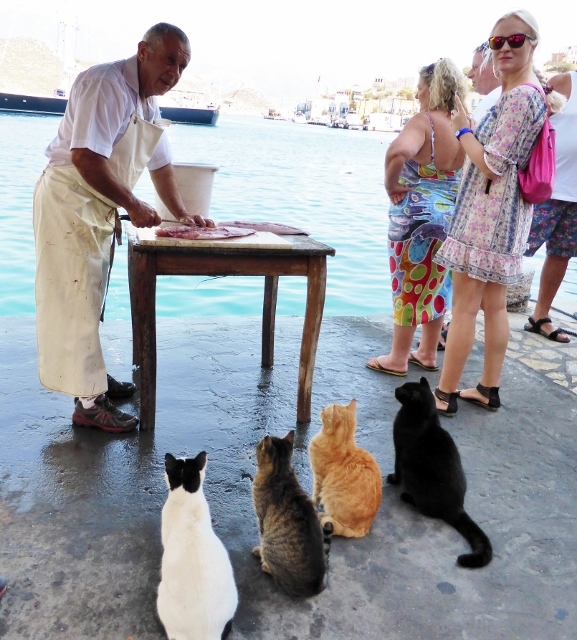 You will also see how sleek and glossy the cats are, well behaved to ensure they get their share of the fish scraps. Tourista looking at the turtles, cats in elegant attention waiting politely for their morning tea. Before lunch we climbed up to the fortress castle, then around the back to other squares and churches, before our long and lovely lunch at Alexander’s. Finally a goodbye to Lesley, which brings to mind another joy of travel, travelling with friends so you can enjoy the experience and create memories. We still have home firmly in our thoughts and it has been busy at the RSYS. We send our warmest congratulations to Richard Chapman, who is now Commodore of the Squadron; we wish you smooth sailing. The same wishes go to Dave Edwards, our new club captain; David Ward, our new Vice Commodore; Christian Brook, our new rear Commodore. Good luck to you all in the coming year. James and I would like to thank Commodore Malcolm Levy for including us in Squadron life for the past four years. Great job, now you will have more time for leisurely lunches in McMahons Point. Lyn and Rene, I hope they thanked both of you for all the work you have done too. 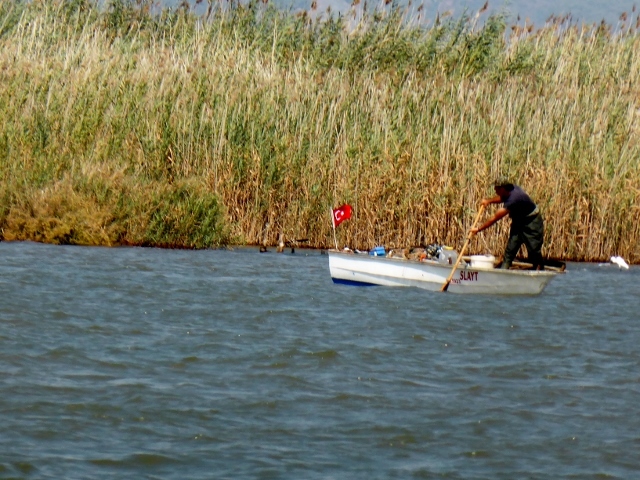 To reach this special part of the southern Turkish coast, we motored through a hidden passage between two islands. The islands act as a wonderful breakwater creating a virtual road of water, which is resplendent with Genoese castles, sunken villages, bays and harbours, large turtles and ancient Lycian rock tombs. and sarcophagi. Many friends and fellow Aussies that are based in Turkey had recommended Kekova Roads. One of the lovely bays is Tersane, or Boatbuilder’s Bay. 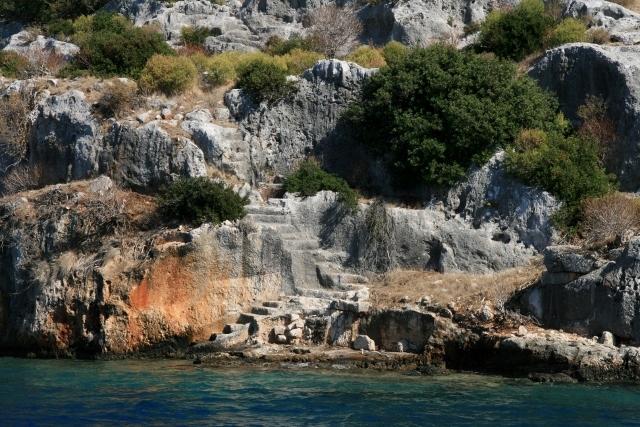 The Byzantine ruins of a church are right on the edge of the water. We raced around in the early morning to get here before the Gulet’s arrived from Kas or other nearby ports so we could go for a swim and really enjoy this special place. Initially, the feeling of Kekova Roads is hauntingly romantic. The sights of entire villages that have subsided, with stone stairs descending into the water and remnants of lintels hand carved into the stone wall, and the front fences under water but still visible after hundreds of years. We motor in a single line, at a funereal pace with many gulets and yachts, viewing history. In the 2nd century AD in Simena, there were terrible earthquakes and the houses on the island subsided into the water. My thought was that the village was abandoned then and the ruins remain. The people of Simena rebuilt in the Byzantine era. It was much later that pirates became such a problem in this part of turkey that Simena was abandoned. 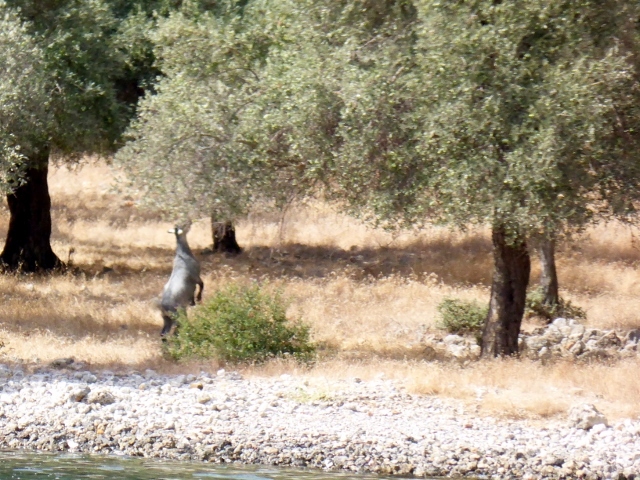 On the other side of the bay, there is Kale Koy and Ucagiz Limani. 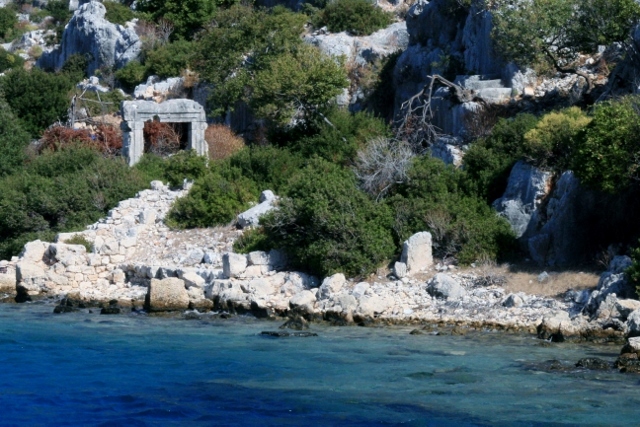 Kale Koy is the sight of ancient Lycian ruins, remediated into a castle by the Geonese knights of St John. 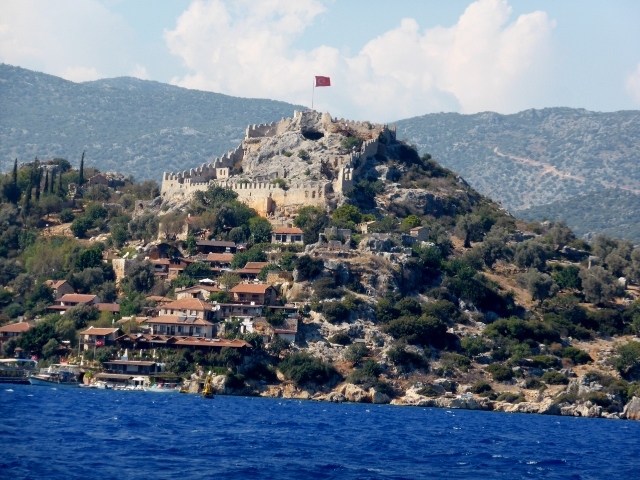 The knights just built the fortress around Lycian rock tombs and a small amphitheatre. The views down to Kale Koy are quite splendid on a beautiful sunny day. Looking up to the castle. 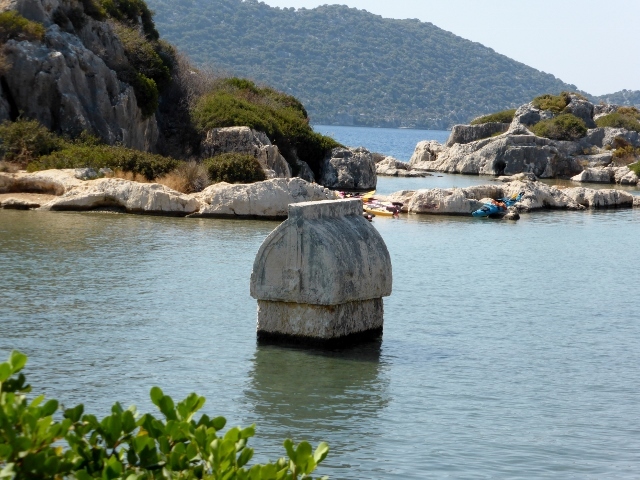 There is a Lycian rock tomb and amphitheater in the castle and sarcophagi overlooking the water, with one subsided into the rock pools and restaurants catering to yachties and other tourists. We enjoyed two wonderful nights at anchor in the peaceful Ucagiz Limani, while during the day we visited all the other bays like Tersane, Spring Bay and Woodhouse Bay. We swam with the turtles in the Woodhouse Bay, making sure they were at a respectable distance away. There were freshwater springs mixing the warm bay water with chilly fresh water causing lots of squeals in Woodhouse Bay. 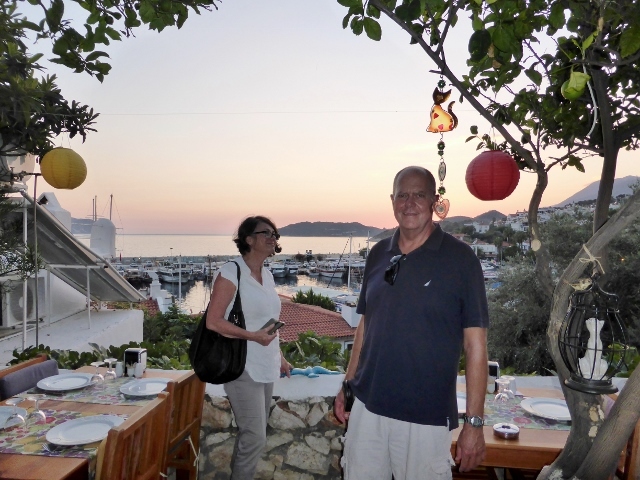 First we will begin with a the beautiful night lights in Kalkan, we enjoyed the Olive Garden’s roof terrace and wonderful food. Rene, we think of you when ever lights come into play. 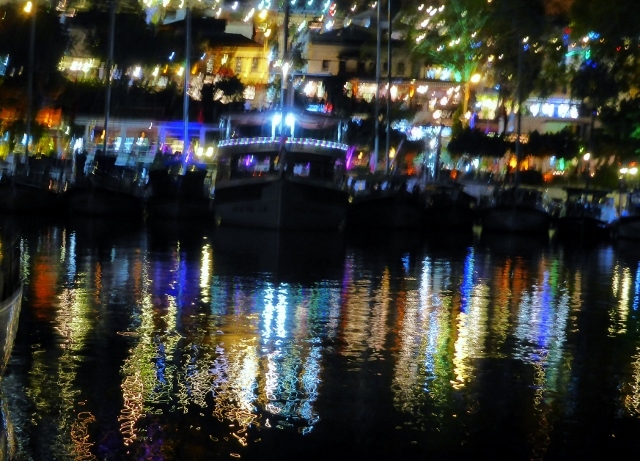 Back at the boat, the whole lovely town of Kalkan was lit like a Christmas tree. We woke up and the boats that had been tied to gulets, were gone by 7am. We thought we would get moving soon after breakfast, no hurry, it was only a short motor to Kas. Then we realised the small harbour of Kalkan was whipped into a frenzy at about 9:30AM, with gulets exiting and entering at speed. With laid lines this would have been easy but the sport is to collect your anchor before you go, while dodging at least three gulets that are aiming for you as you try to retrieve said anchor. Blood sport then escape. 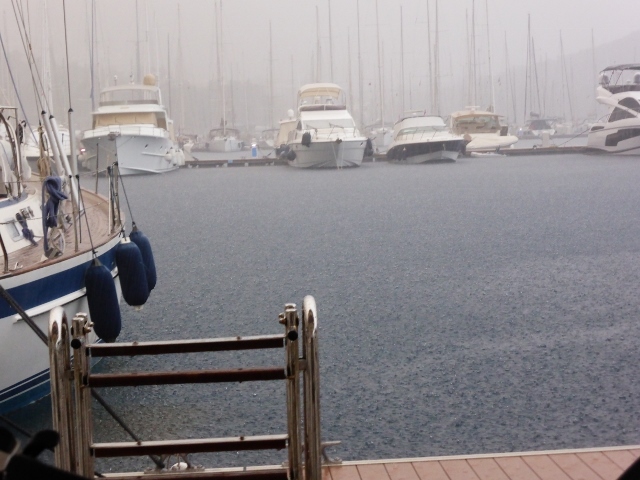 We were able to take a breath and before we knew it we were at the glamorous Kas Marina. A splendid pool, showers, restaurants but we certainly wanted to see the charming city of Kas. After a quick swim, we went in to wander the hilly streets and we were beguiled with all the wonderful shops. First a few photos of Kas and then the shopping. 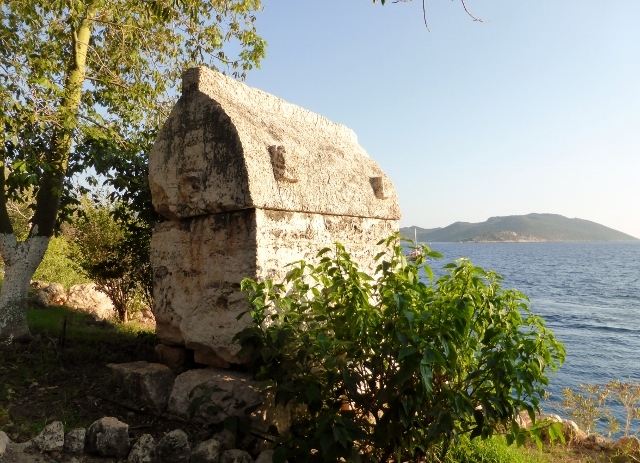 Just above this point and all through Kas, there are Lycian sarcophagi. Unlike the way we place cemeteries on the outskirts of our towns, the Lycians opted for up on a mountain or along the coast. According to a very interesting and helpful website, www.lycianturkey.com, the Lycians integrated their dead into their life. On our way to dinner, we were overwhelmed by the wonderful, captivating shops selling so many great products, found in the streets of Kas. 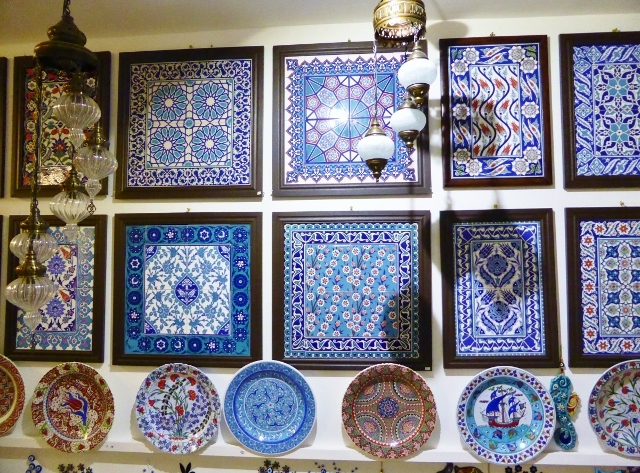 My favourite art gallery, pottery shop, Tugra Art Gallery, belongs to Ali Yigit. He had my Hammam bowl but also beautiful pottery and much more besides. 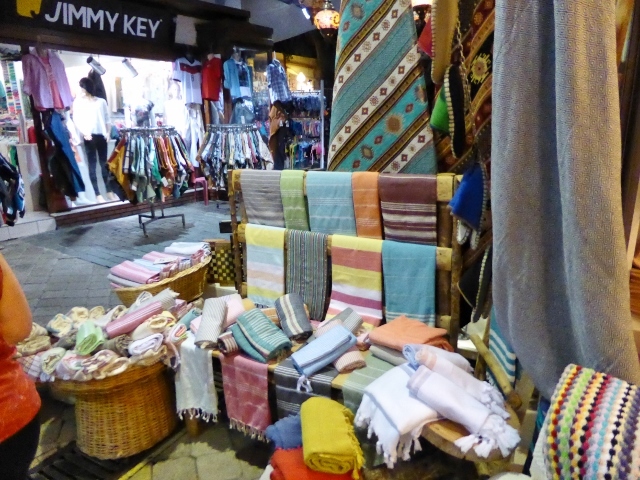 Another favourite purchase, has been peshtemals and this store had lovely towels both for beach and home. 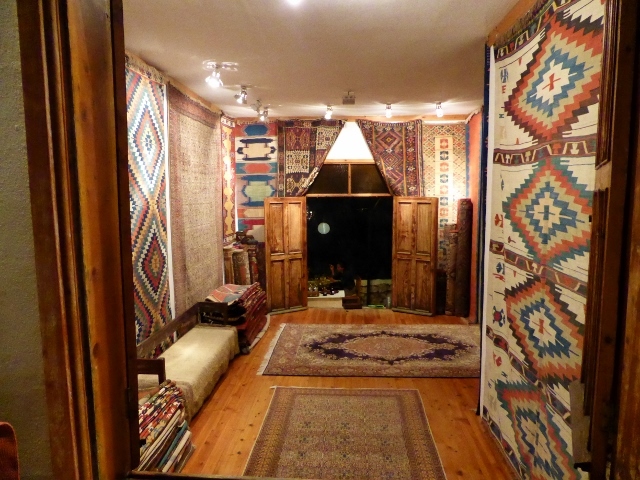 Kas is known for its rugs and we enjoyed seeing these after a wonderful meze dinner at Ikbal. 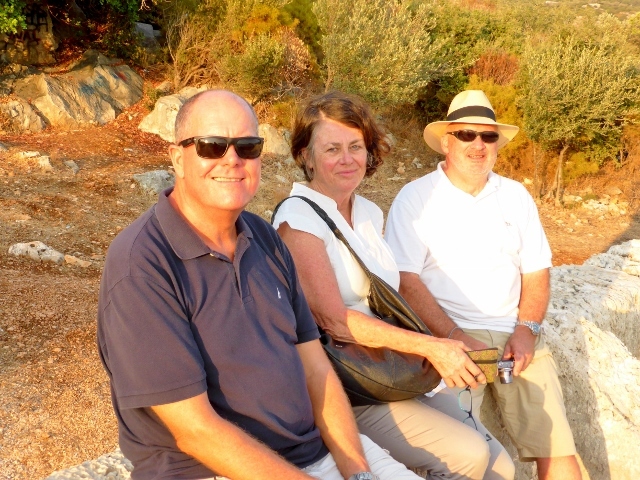 Tomorrow, we are on our way to Kekova but we will be back to Kas in a few days. 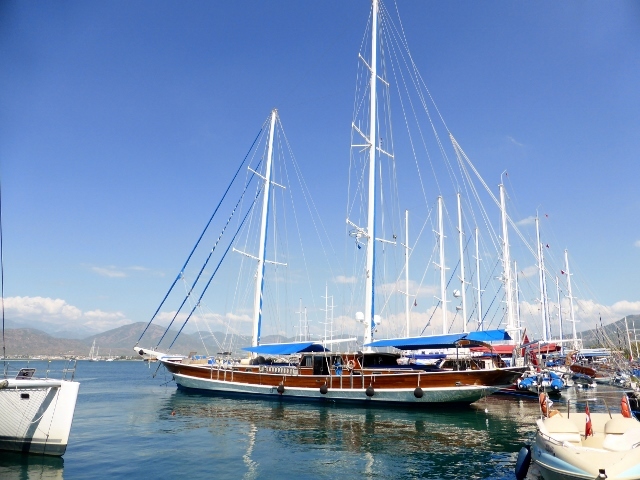 We have been doing side trips, while we were in Ece Marina in Fethiye. The marina is so convenient, with showers just up the pontoon, cafes, and a Carrefours market . 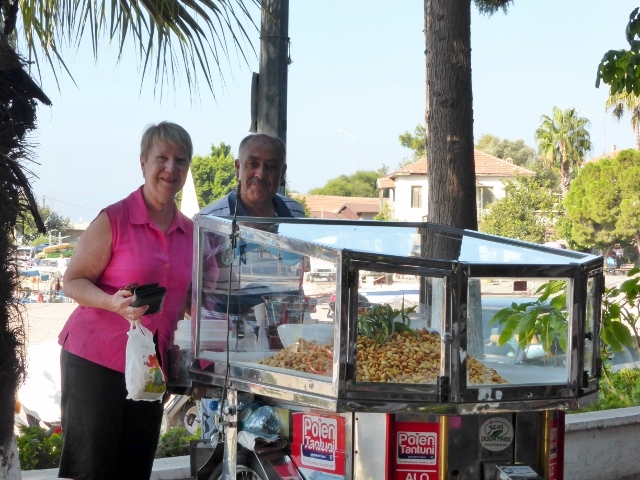 The orange ‘domus’ (shared taxi) takes us to many places on it’s regular run – a circuit about 5 km around Fethiye. 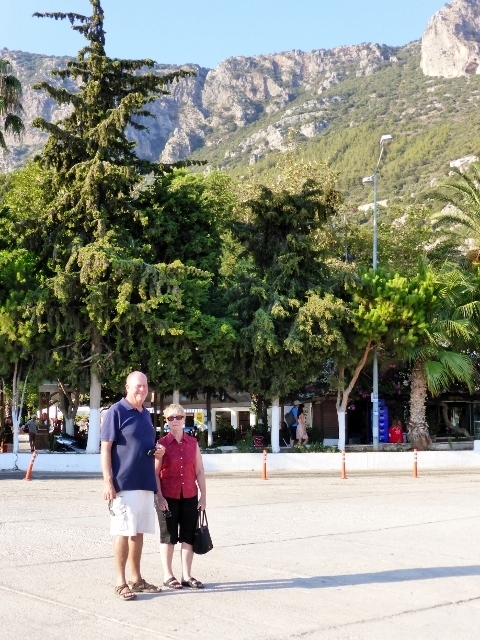 We can also walk into town and take other domus to Calis (pronounced Chalish) or Oludeniz. Domus services in Sydney would be absolutely wonderful, imagine being able to pick up a mini-van going from McMahons Point to Neutral Bay, do your shopping for $5.00 return. Better than a bus and they pick up anywhere, drop off at a bus stop. They are incredibly efficient and easy to use. 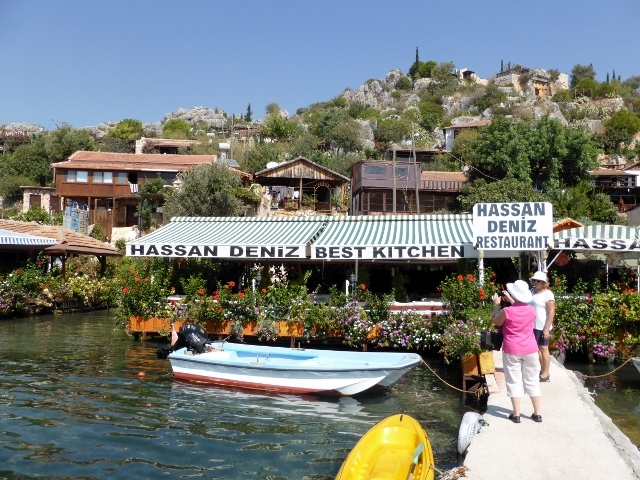 There is also a shared water taxi between Fethiye and Calis, which we learned about from a great local blog, Turkey’s for Life. 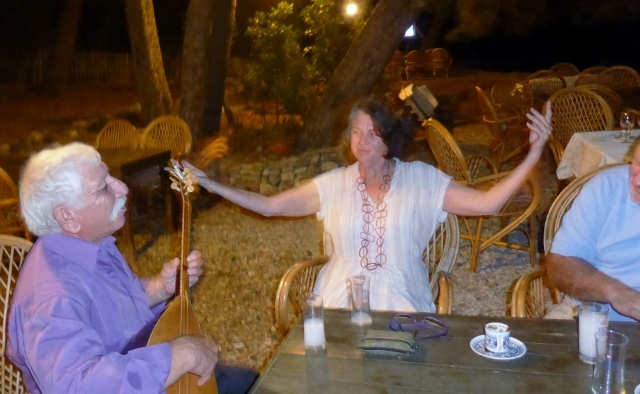 Julia talks about life in Fethiye and travelling about Turkey. A great resource for sailors sailing the Turquoise Coast, because she covers so many areas of Turkish life. Once Lesley had arrived we were ready to depart, engines starts right away, all systems go until we get to the passerelle, which after two weeks of not being removed, firmly refused to let go its mooring. 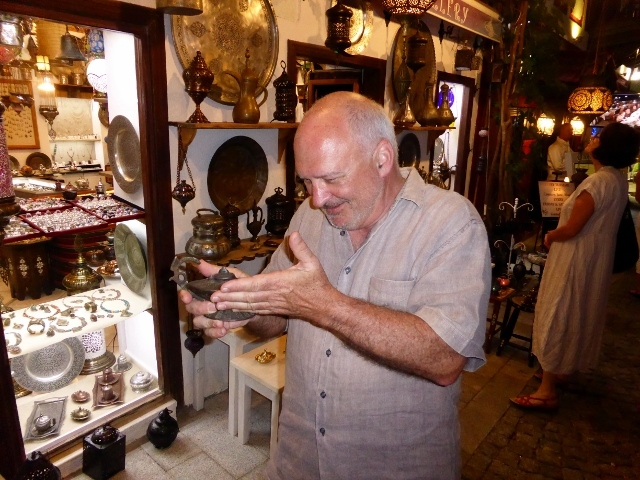 After much ado, James had to unscrew the whole fitting and take the entire fitting to Captain Eddy, who effects such repairs in Fethiye. He had the boat next to ours on the marina, he said “Leave it, it will be 1 hour, so we had lunch. James went to collect the piece but returned crest fallen, no one at the office. 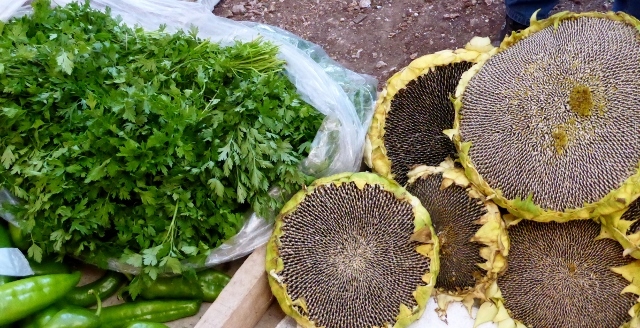 You think we had dinner in Fethiye, don’t you? But can we say Captain Eddy delivered, although it took 90 minutes, for the princely sum of 40 Turkish lira ($AUD 20), Thank you, Captain Eddy and to your industrious team. We had a lovely night anchored off Gemiler Island, swimming, watching first the paraglliders then the supermoon rise over the mountain. 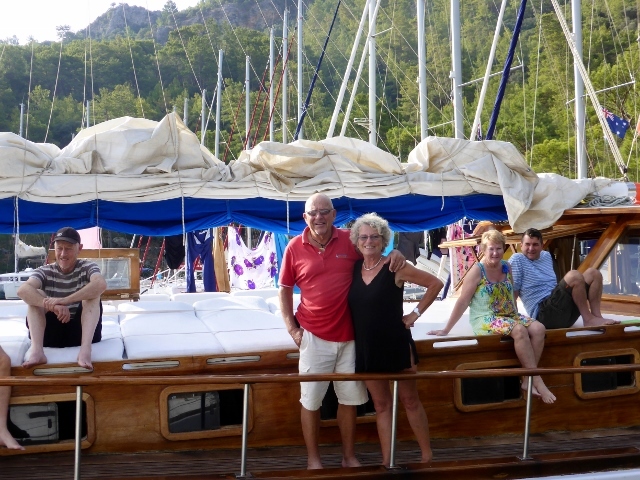 The next morning, we sailed past Oludeniz, also known as Costa del Blackpool, then Butterfly Bay, so that Lesley could see the sights. 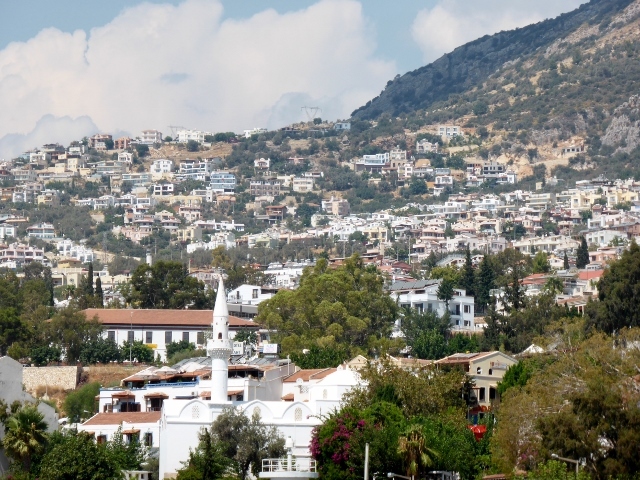 We then continued motoring to Kalkan, for about a four and half hours. Oludeniz is in serious danger of becoming over developed. Thanksfully Butterfly Valley is unspoiled. 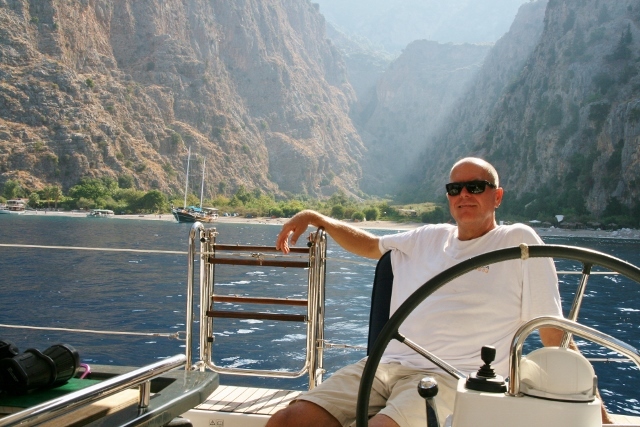 The coastline is not conducive to anchoring, you sail pass Long Sandy Beach and arrive in Kalkan. Last night we had a wonderful dinner on the rooftop terrace of The Olive Garden, with traditional Turkish meze and dinners. 98% of the clientele would be well off British retirees or vacationers. Every restaurant, all stylish, is the similarly full of the British. The entire town is the same, we thought we were in England. We were like sprightly Aussie kids, not a bad feeling. *Salcombe is one of the priciest seaside villages in England. Are you allowed to pun on blogs? 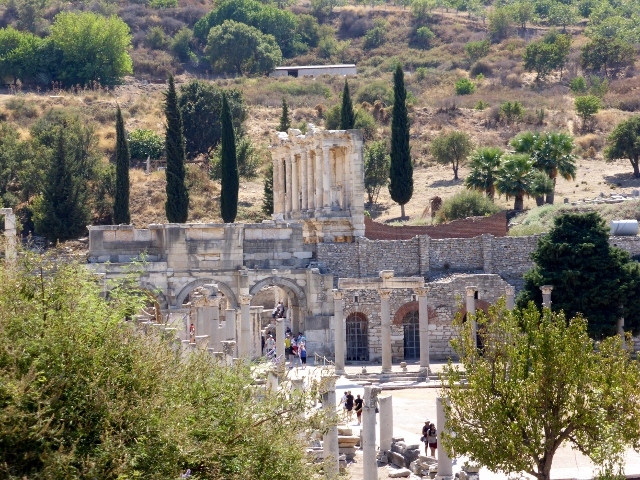 The Meander River runs through Ephesus [or Efes in Turkish] and completely changed the course of Ephesus in history. Imagine a city of pearl marble shining out to sea and you could sail right up to it, the sun rays dancing off the buildings and roads as you approached. A chariot would have pulled up to the wharf and taken you up past the amphitheatre for 25,000 people, past the library with its exquisite marble edifice, up to the temple of Artemis, where you could offer a sacrifice to the goddess and give thanks for your safe return home. 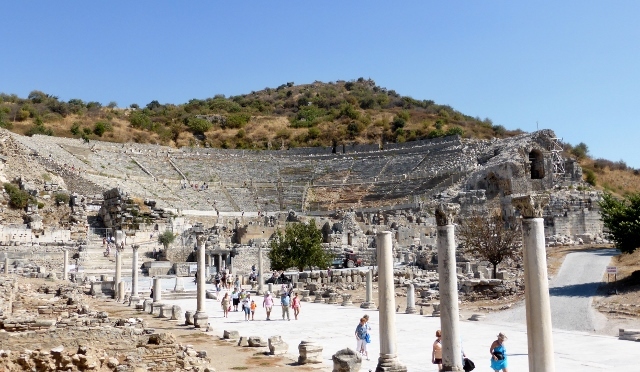 Ephesus was settled before the Bronze age, with Neolithic remains dating back to 6,000 years BC and it grew and retracted until circa 614 AD when both a large earthquake hit and destroyed many buildings and the Meander River silted up the port. 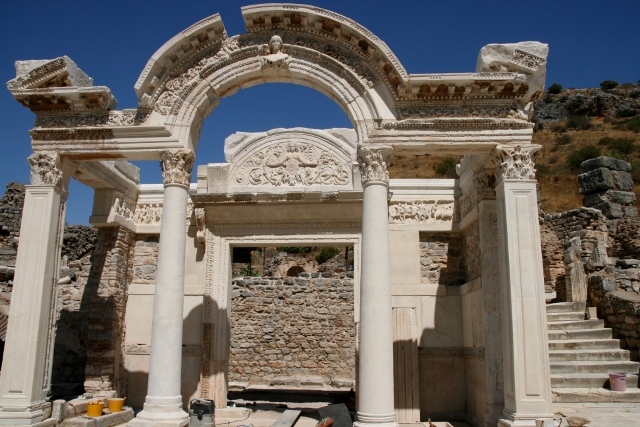 Today the city of Ephesus is five kilometres inland from the Aegean Sea. Ephesus did survive after this time but it was much smaller settlement. Religion has always been important here. The Hellenic gods, particularly Artemis were worshipped. St John came to Ephesus and helped to bring Christianity here. He is said to have written some of the Revelations here. There is debate that he brought Mary, Mother of Jesus to Ephesus and that she was assumed into heaven from here. 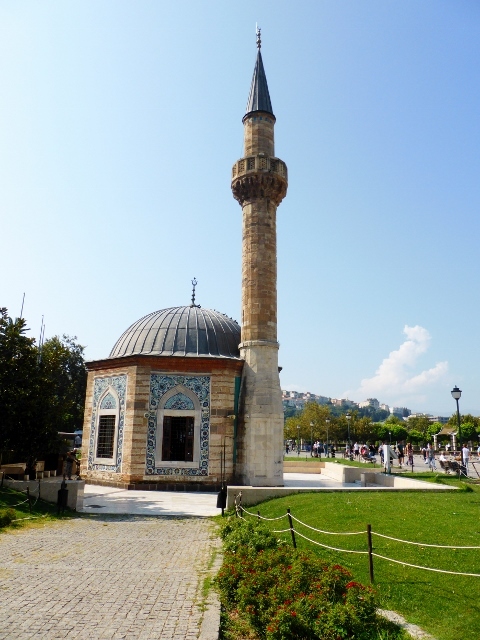 Jesus and Mary are also sacred to Muslims, so Efes is important to them too. 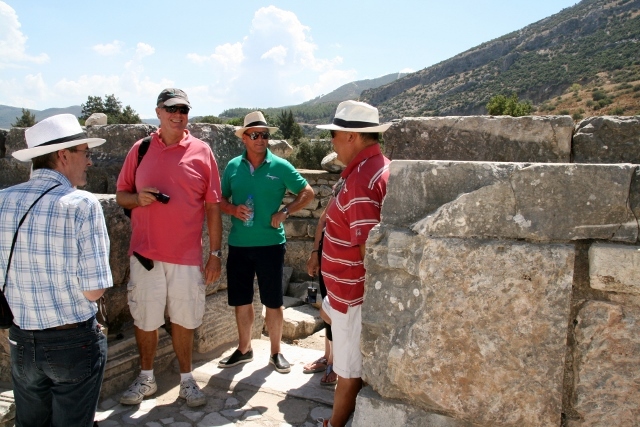 Our guide, Haldun, while showing us Hadrian’s Temple told us the Romans had temples to their gods and their emperors. They could determine who was Christian because Christians would not sacrifice at the Roman temples, so they were sent to the amphitheatre to fight with the lions instead. Amphitheatre seating 25,000 thousand, five times larger than most. 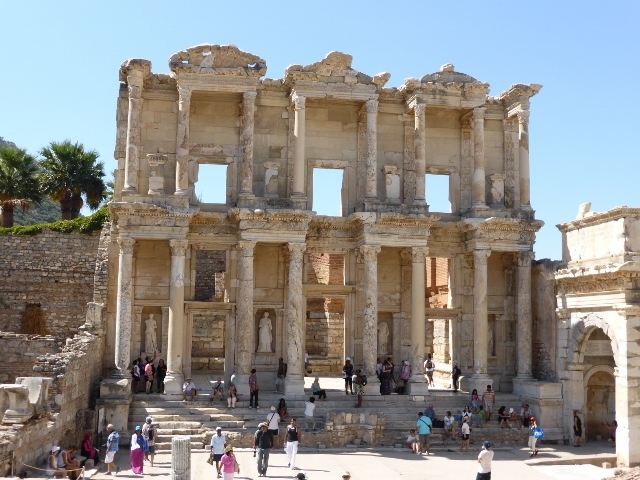 An early visit to library of Celsus is a memory I have captured in a photo. I have always been in awe of its grandeur. It held thousands of scrolls made of parchment and the building faces east so it was able to capture morning light. Egypt became very jealous of the library and decided to suspend supply of papyrus, but the clever Ephesians developed parchment, which was much more durable and longer lasting. The majestic library of Celsus. 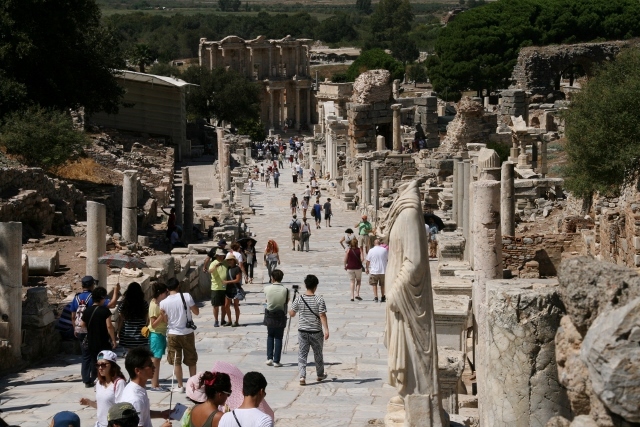 Busy Ephesus, cruise ships bring thousands of tourists every year. We were with a group of about nine people with the wonderful guide Haldun, who gave us so much information but also made the history come alive. I warn you, he does test you to make sure you are paying attention. Many of you know that I lived in Izmir, Turkey for just under three years in the mid 60’s. My brother, Tony and I went to an American/International school and my sister, Linda, was born there. 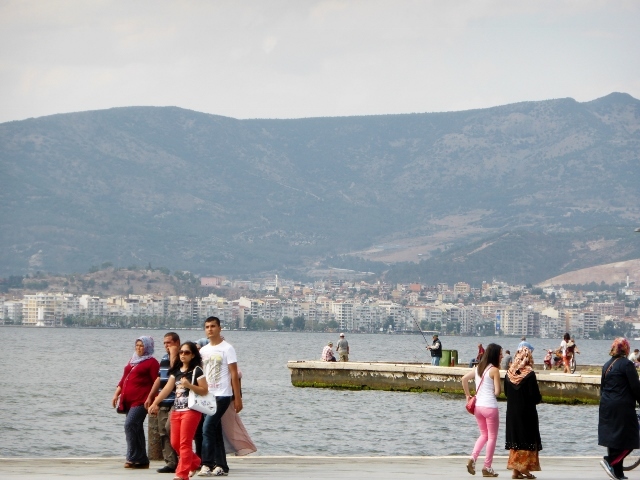 Izmir is the third largest city of Turkey, in 1965 at just under 800,000 people and now about 3 million people. So things weren’t the same, the growth was both exponential and hard to fathom. Surprisingly I could still find my neighbourhood and I could almost find my way to school except the old two story building was now a nine story commercial building. Now stop trying to do the math and figuring out how old I am, just read the story, which is dedicated to my sister, Linda. 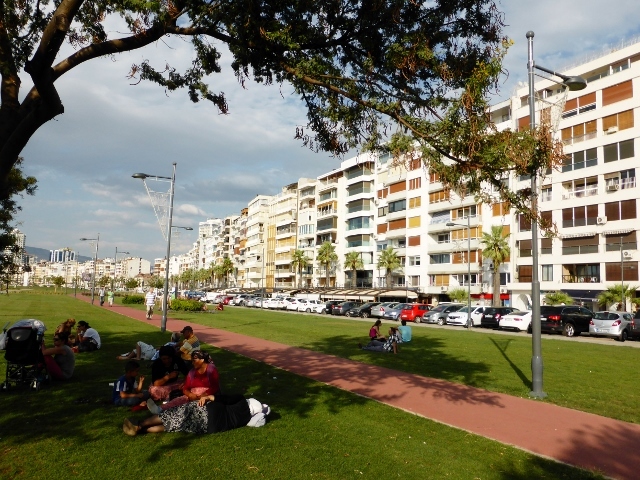 As much as Izmir has grown, our neighbourhood, Alsancak has had only minor changes. Our street has two striking visual differences, our wide boulevard has palm trees on a big median strip now. There were no stores on the boulevard then, now there are masses of stores at street level. It’s very Double Bay. It is on the southern shore of the gulf of Izmir, a giant harbour. 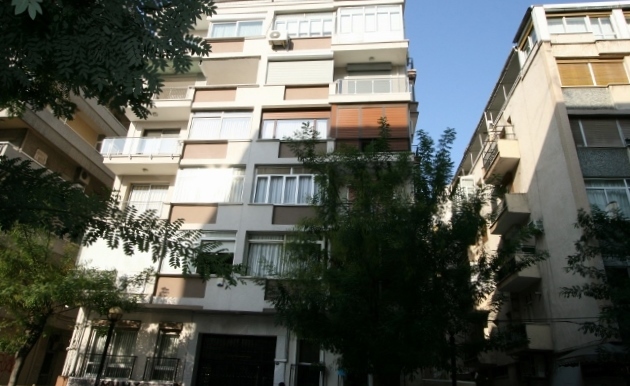 We lived one street back from the harbour and Birinci Kordon or the esplanade. The Kordon seems much wider as if they have reclaimed some of the harbour. 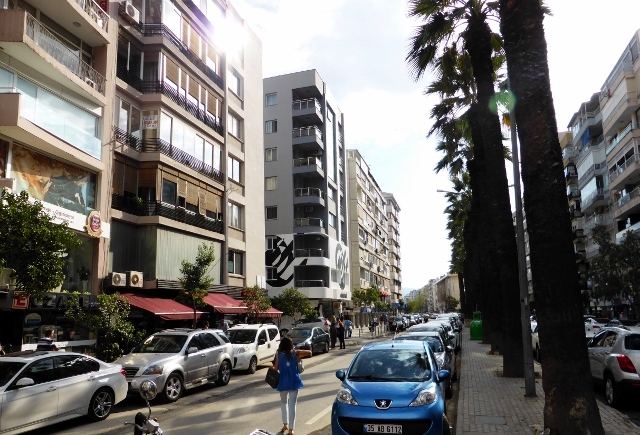 This quarter, Alsancak, both now and then was home to upper middle class Turkish people and it was always a lovely place to live. It looks to me, that they have added to the Kordon to add parkland, bike paths and parking by putting it over the harbour. 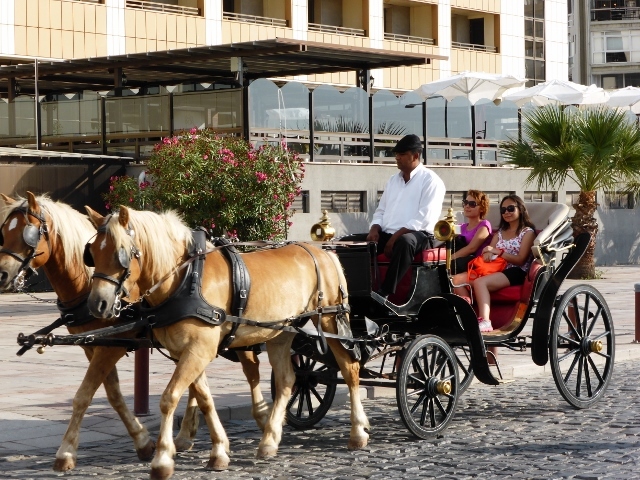 Izmir was a very European city then and still is today. We had a car but much of our day to day travel was in a horse and carriage. Today they seem to be mainly for tourists but the horses are still lovely. The bread sellers would come up our street, with a huge tray of bread balanced on their head.They would call out the types of bread they had, “bread man, bread man, get your fresh bread” . We had a basket on a very long string that Raphon* or my mother would put money into the basket and lower to the bread man, who would take the money and put in the correct bread. There was a bit of calling out in the neighbourhood. This is an apartment just around the corner that looks like the one we lived in. The actual buildings we lived in have been retrofitted for earthquakes and when they did that, they added more floors to the buildings. There is quite of bit of parkland and public space in the city. The harbour is a long semicircle and in the 60’s, there was no sea wall and the water was also filthy, Linda’s Dad got a call to see if he would join a search and rescue, when a taxi went into the harbour on a stormy night during a gale. This is fine weather but you can see there is no wall or barrier here now and that is what most of the harbour was like in 1965. He was one of the scuba team that braved the gale and hepatitis to go down on a few occasions and bring back the bodies, including one of his colleagues. 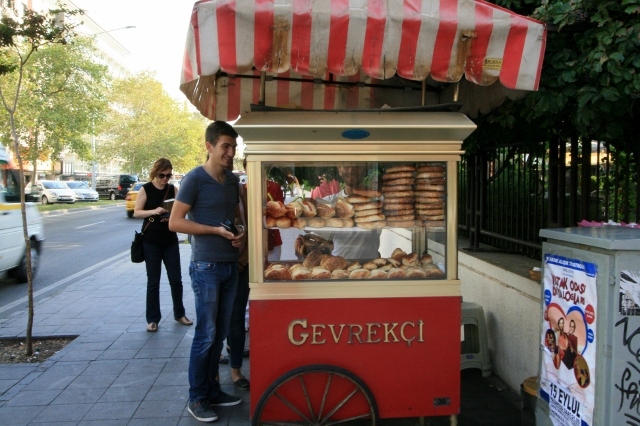 There are two sights that I remember from Izmir. The clocktower built in Ottoman Rococo. 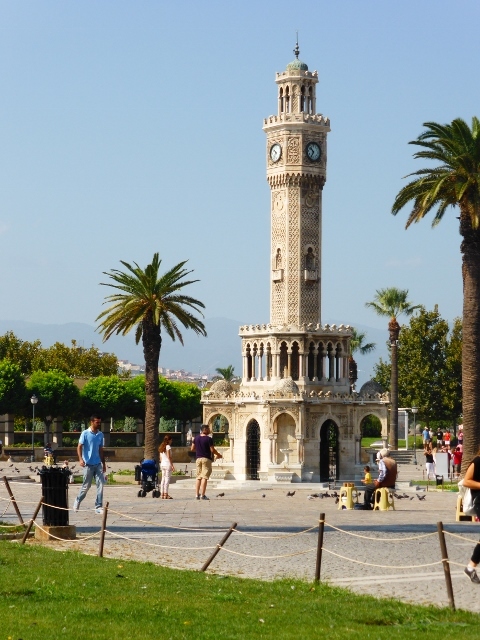 The Izmir clock tower, Ottoman architectural style by the Frenchman, Raymond Charles Pere. 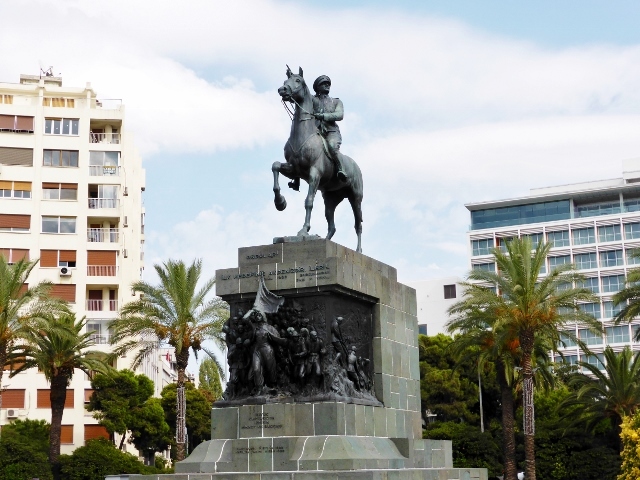 and a wonderful statue of Ataturk at the end of our street. Ataturk created the modern secular Turkey you find today. Freedom of religion is practiced. Now women are allowed to wear scarves but they didn’t in the sixties.